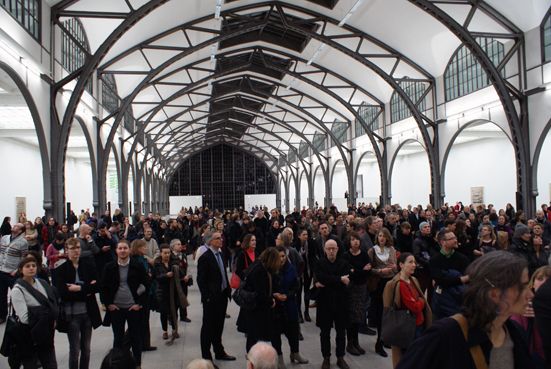 The audience listening to Rain at the vernissage of Part File Score, Berlin 1 February 2014. The Scottish artist and Turner Prize winner Susan Philipsz exhibits from 2 February until 4 May 2014 a soundscape in the historical hall of the Hamburger Bahnhof, the museum for contemporary art in Berlin. The sound of Hanns Eisler’s music Fourteen Ways to describe Rain (1941) composed for Ivens' film Regen (Rain, 1929) can be heard in the large hall of the former railway station. According to Philipsz this hall reminds the audience of arrival and departure, of separation and reunion, a melancholic feeling, which can be heard in various scores Eisler composed for films like Rain. The soundscape is accompanied by large silk screens on the wall, with collages of scores and FBI files. The exile Eisler, emigrated to the US in 1936 because of the Nazi’s, was forced to leave the US and was banned due to communist activities, he was called ‘the Karl Marx of music’. These collages very much look like the video installation of Steve McQueen, the filmmaker of 12 Years a Slave, with the title End Credits, presenting a six hours video of only pages from the enormous FBI-files about Paul Robeson, another friend Ivens. A very current subject since Edward Snowden proofs how nowadays secret services are functioning. Susan Philipsz, detail of Part File Score, 2014. Five-foot-five; weight 175lbs, heavy and with a prominent stomach. 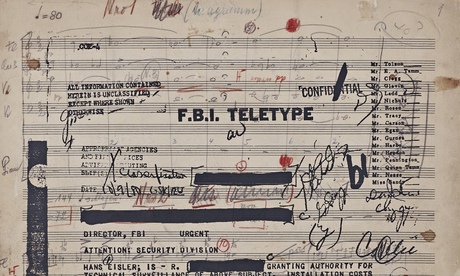 Blue-eyed and balding: this is how FBI files describe the composer Hanns Eisler. Born in Leipzig in 1898, Eisler studied under Arnold Schoenberg and became a friend of Bertolt Brecht. Half Jewish, half Lutheran and a supporter of the German Communist Party, Eisler's work was banned by the Nazis in 1933 and spent the prewar years travelling through Europe and to Moscow and Mexico, before obtaining a permanent United States visa in 1938. There, he worked first in New York and then Hollywood, before he was suspected of communism and denounced, not least by his sister, who worked for an American intelligence agency. Eisler was derided during his investigation by the House Un-American Activities Committee as "the Karl Marx of music" and Hollywood's top Soviet agent. Having been blacklisted, Eisler was finally forced to leave the US in 1948, firstly to Austria and then to East Berlin, where he settled and wrote the national anthem for the GDR, before once again falling out of favour. He died in 1962. Eisler's was a 20th-century life, filled with the private, professional and political complications of his age. How apt to meet him again in a former Berlin railway station, in a sound work and series of large silk-screens by the Glasgow artist Susan Philipsz. A Turner prize winner in 2010, Philipsz has lived in Berlin since 2001. She was awarded an OBE earlier this year. Part File Score, Philipsz's first major public show in her adopted city, fills the resounding emptiness of the Hamburger Bahnhof with three of Eisler's compositions, each performed for two instruments – piano and violin; and cello and trumpet. Her 24-channel installation, in which Eisler's compositions for films – Prelude in the Form of a Passaciagla, for the 1924 abstract animation Opus 111 by Walter Ruttman; Fourteen Ways to Describe the Rain, for Joris Ivens' 1929 film Rain; and Septet No 2 for Charlie Chaplin's 1928 movie The Circus – play one after the other. Eisler had been a student and friend of Schoenberg, and in Philipsz's work, each part of Eisler's compositions is recorded separately according to Shoenberg's 12-tone chromatic scale and relayed through loudspeakers attached to the hall's 24 supporting pillars. A series of large silk-screens on the side walls tells the miserable story of Eisler's years in America – as recorded in his FBI files. The pages, with all their blacked-out redactions, are printed over the composer's own annotated musical scores. We get glimpses of his life, times and suspected crimes, as well as his contacts with Schoenberg, Chaplin, "Bert" Brecht (as the files call the exiled German playwright and director), Theodore Adorno (with whom he co-authored Composing for the Films in 1947) and Fritz Lang. There are snatches of Eisler's own depositions, as well as the details of the cost of his surveillance and phone-tapping. The FBI found nothing. The sounds echo and strain around the long, arched hall. A Berlin rail terminus until 1848, the Bahnhof was first converted into a transport museum, but since the mid-1990s it has been one of the city's main contemporary art spaces. I follow the music and lose myself in the notes. A passage begins behind me, then slides here and there in a great unravelling sound that seems to fracture even as it comes together. One note from a speaker nearby, the next from far away. The sound coalesces in space, and never loses its coherence and musicality as the notes attack from different parts of the building, even though one feels that everything is about to fall apart. Standing next to a speaker, one becomes aware of how atomised the music has become, of how important are the gaps, the silences and pauses. Philipsz has turned Eisler's music into something that sounds almost like an interrogation. The metaphoric resonances and relationship to Eisler's fractured life, with its proximities and distances, its lapses and secrets (and who knows what secrets there might have been; the things the FBI never recorded, the things hidden under those felt-tipped redactions), and the sheer strain of keeping his life on track could not be made more clearly. Something similar occurs in Steve McQueen's 2012 End Credits, which uses Paul Robeson's FBI files as the basis for a work that tracks the relentless paranoia of state surveillance. Neither McQueen's nor Philipsz's works could be more timely. But the important thing is being here, walking and standing still, listening and looking. The empty space has its own resonances. The mind tries to orchestrate the other people walking, running, lingering. I turn it into choreography. As the music goes on – there are only the briefest pauses between the three looped compositions – a couple kiss on the huge, empty floor. A woman drapes herself over a bench and appears to sleep, or sink into herself, as her child plays nearby. Someone else patrols the perimeter, doing circuits. The music goes on and on as people come and go. In the music there is rain, Chaplin caged with a big cat, abstraction. Written for the movies, Eisler's music is displaced by its context, by time and by our experience of it. Being here is complicated. One also thinks of other works by Philipsz, and in particular ofher sound work Study for Strings, the sound amplified at the far end of the railway station platforms in Kassel for the last Documenta exhibition, the music lost in the wind and the noise as one looked across to platform 13, where once the Jews departed, never to return. But everything returns one way or another. When Philipsz won the Turner prize I wrote that the way she used space was as important as the music itself. Here, space becomes place. One doesn't necessarily need to know of Eisler's personal difficulties to get a sense of Philipsz's elegiac intent. As much as Part File Score keeps returning to another man's life and its ambitions, mistakes and travailles, it is hard to be here without thinking of one's own life, where it might be leading.